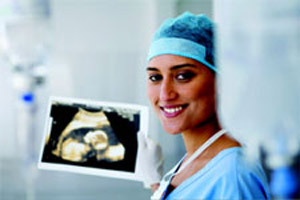 While the majority of the general public is aware that one of the major uses of ultrasound technology is to be able to see a baby while it is still in the womb, thereby being able to check on the health and gender of the baby, many may not be aware of all of the other diagnostic uses of ultrasound technology. The ultrasound technology that is used during pregnancy is commonly referred to as Obstetric sonography. Some of the other uses include echocardiography, abdominal sonography, Carotid ultrasonography, pelvic sonography, arterial sonography and more. The technology is a diagnostic imaging technique that uses sound waves in order to visualize subcutaneous body structures including tendons muscles, joints and internal organs for possible pathology, lesions or tumors. The term “ultrasound” refers to all sound waves with a frequency above the audible range of human hearing, at about 20,000 Hz. Diagnostic ultrasound uses frequencies between 2 and 18 MHz, with the higher and lower levels being used for different parts of the body that have different densities. Ultrasounds or sonography is widely used in medicine for both diagnosis and therapeutic procedures. An Ultrasound technician or sonographer will typically perform the scan, making sure that all areas that need examination are included. The final report will then be interpreted by a Radiologist, who is a physician who specializes in the application and interpretation of medical imaging modalities or by other doctors depending upon the situation, such as a Cardiologist in the case of echocardiography. This technology is used in many different medical specialties as it is very useful for imaging the soft tissues of the body. This makes it very effective for looking at the various organs within the body. Cardiac ultrasound or echocardiography is essential to diagnose the dilatation of the heart and the the function of the various valves and ventricles. Arterial sonography can also assess the health of the arteries and look for possible obstructions. Abdominal sonography can allow the physician to have a look at the solid organs of the abdomen such as the liver, the gall bladder, the pancreas, the kidneys and spleen. Anesthesiologists also commonly use ultrasound technology in order to guide injecting needles to avoid nerves. While ultrasound technology is a wonderful part of a woman’s pregnancy, ultrasound technology can also be of great benefit to a newborn baby. If there are any possible cerebral abnormalities, bleeding or hydrocephalus and ultrasound can be performed upon the soft spot in the skull of the newborn until it completely closes at about 1 year of age. Ultrasound technology has proven useful in many different medical specialties and the uses for this technology is continuing to expand, especially as the technology advances to 3D and 4D technology. The opportunities for certified Ultrasound technicians are growing as well. There are two year programs that can get you working sooner or you can also take a 4 year program. Most states do require a license, however you should check with the state that you live in as requirements vary. Typically a recognized certification or a license will allow you to command higher pay and it is always recommended that you complete an accredited education program.